The Autumnlands: Tooth & Claw #3 - Written by Kurt Busiek, illustrated by Benjamin Dewey, colored by Jordie Bellaire, lettering and design by John G. Roshell & Jimmy Betancourt of Comicraft, published by Image Comics. Three cheers for the Champion! Here here here! The Champion was summoned to save the magic and the people of the great city of Keneil…make that the-once-great city of Keneil. But the Champion, Learoyd, is odd in appearance and manner. Yes he saved the people of Keneil from the low-born bison raiders, but Learoyd is brash and cares little of anyone. And what tidings does the fox-woman trader, Goodfoot, bring to the high-born brought low? I have been hoping for a good fantasy comic for sometime now. Sure, aspects of other Image titles fall into this category, but Tooth & Claw…errrrr…make that The Autumnlands: Tooth & Claw (I was wrong about the heavy metal band naming mixup that I talked about last month, as clarified in the back matter of this issue) hits all the right fantasy notes: swords, sorcery, bipedal animal characters, a legend of a great savior, politics, classism, and so much more. The first two issues grounded the series firmly in a world that anyone familiar with the term dungeon master can relate. Then Busiek and Dewey change things up with the intermixing of an additional genre. The new sci-fi angle is downplayed, subtle, mostly used to show that there is more to Steven T. Learoyd than we first thought. Through subtle, unacknowledged artistic sequences — beautifully delivered by Dewey, by the way — we see a possible justification for how the Champion was able to decimate the bison raiders so easily. We also see a problem for Learoyd that is sure to complicate matters in the near future. 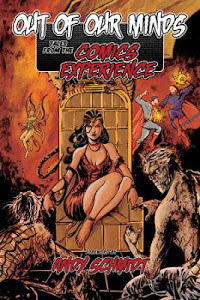 This issue also sees the introduction of Goodfoot, a fox-woman trader, who shows up right when life at the fallen city of Keneil is most desperate and confused. She appears with her charming demeanor astride a giant cricket — insects look to be transportation / pack animals in this world — and she bears gifts and advice…for a reasonable price. Goodfoot is absolutely stunning in her design, as Dewey gives her such style and personality through her character acting and through her wonderful costuming. She is simply marvelous with her weaved hair decorations, her traveling hat (complete with a decorative crystal and dragonfly wings instead of bird feathers), large bangles, green-buttoned shirt, brown shoulder pads, scarf, and orange skirt. 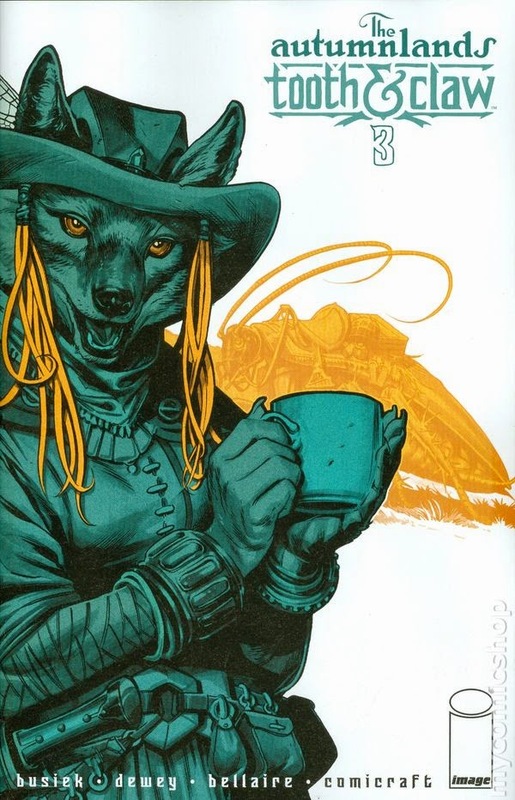 Dewey has put such time and consideration into every aspect of Goodfoot's design that when mixed with the tremendous personality Busiek gives the fast-talking fox, it is nearly impossible not to fall for the character's charms. I sincerely hope Goodfoot sticks around for some time to come. Bellaire's colors continue to define and solidify the look of this book, and although we don't see the brilliant displays of magic that made the first issue so striking, there is still plenty to dazzle. What I failed to notice in the first two issues, was that during the more dramatic conversation scenes, where backgrounds are of lesser importance, Bellaire opts to knockout (change the black inks in a portion of a panel to another color for added effect) the backgrounds to more subdued color tones than what is portrayed in the foreground. I have seen many artist flat out omit detailed backgrounds in their art, but Dewey avoids taking the easy road, giving the reader much to see, while Bellaire creates the visual hierarchy and additional perspective with her knockouts and color opacity shifts. The characters might not be using magic this issue, but the technical choices of both artists bring a stylistic type of magic all the same. 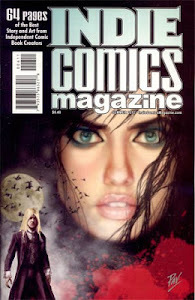 Do you have any doubts that I am enjoying this new fantasy comic series? The Autumnlands: Tooth & Claw is a beautiful, well-told story that started strong and does not appear to be slowing down. This issue clocks in at 24 pages with a $2.99 price and has absolutely no advertisements to interrupt the flow of the exceptional story. Compare this to certain other high-profile Big Two books that are 20–22 pages at $3.99 (or more) and with far too many meddlesome ads to pull you out of story. If you are looking for a great, beautifully-crafted fantasy comic, then look no further than The Autumnlands: Tooth & Claw. The next issue cannot come soon enough. HIGHLY RECOMMENDED! 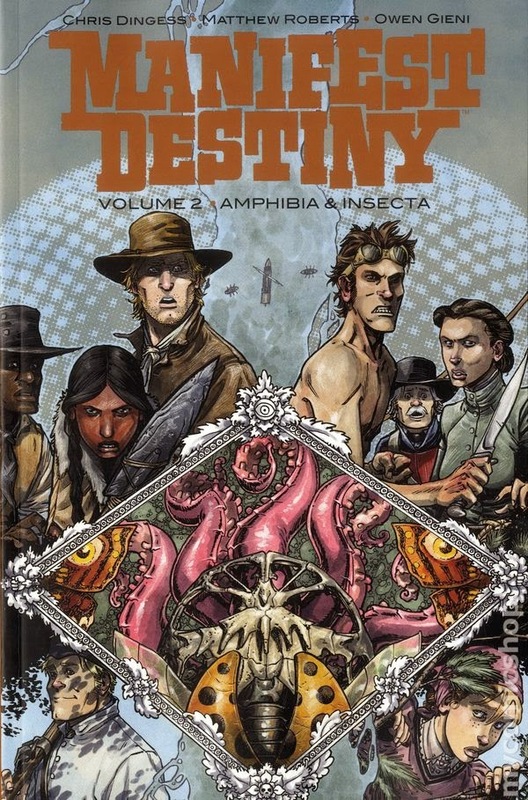 Manifest Destiny: Volume 2 - Amphibia & Insecta TPB - Written by Chris Dingess, illustrated by Matthew Roberts, colored by Owen Gieni, lettered by Pat Brosseau, edited by Sean Mackiewicz, published by Skybound, an Image Comics imprint. In 1804, Lewis and Clark set out to explore the uncharted American Frontier with a crew of enlisted men, mercenaries, and convicts. Part of their mission, the one that few others are aware, is that they were also sent to discover and hunt monsters. Their hunt has not been going well. After the horror and catastrophes found at the fort, and the loss of many of their men, Lewis and Clark continue their exploration of America, only to hit another misstep when their riverboat snags upon something in the water. When half of the men investigate, they discover a new threat lies beneath, as the other half discover the horror that lurks in the woods. As you might remember from my post in June 2014, I kind of flipped out over the first trade of Manifest Destiny. I had heard the series was well done, but I had no idea of just how compelling and exciting this book was until I had read those first few pages; I hammered through the trade in a couple of days. When I saw that the second trade was soon arrive, my pulse quickened with anticipation and I picked it up the day it released. I smashed through this new volume in two sittings — I would have preferred one sitting, but you know…life — and was brought fully back into the creepy, yet thrilling world I first enjoyed over six months ago. Again the creators give us six terrific issues in this reasonably priced ($14.99 retail) collection as we discover — the hard way — new monstrous threats lurking in the American wild. Roberts’s depictions of both the amphibia and the insecta portions of the creatures in this book are wild and freaky as all heck, yet the monsters remain true in their design to the animals upon which they are each based. Whether the monsters have exoskeletons, ear drums, a proboscis, a curved bone structure for the skull, or natural body movements or postures, Roberts captures it all perfectly with the attention to detail of someone who deeply understands the anatomy of what he is depicting. The creators utilize splash pages and larger panels sparingly, but when they do appear, they deliver the perfect emotional one-two punch to make you gasp in shock. The visual and written storytelling is just as strong as the previous volume, and we gain additional insight into not only Lewis and Clark, but many of the unsavory men in their command. The volume ends with the promise of more adventure, more horror, more of the mysterious arches, and more of the amazing Sacagawea (aka…the wise, pregnant, Native American murder machine), and I will be there eagerly waiting to see what comes next. This comic series is positively fantastic, and blast to read. You need to check this out. VERY HIGHLY RECOMMENDED! Not Much… - Although having only on book in my pull this week is a mite disappointing, there really wasn’t much gettin’ on my left nerve this week. That said, I am a little stressed as I’m gearing up for a new round of life changes with the job search, which looks to be… interesting… as I try to find something that will allow me to continue physically attending my Publication Design class; lifelong learning is a commitment I hold dear. 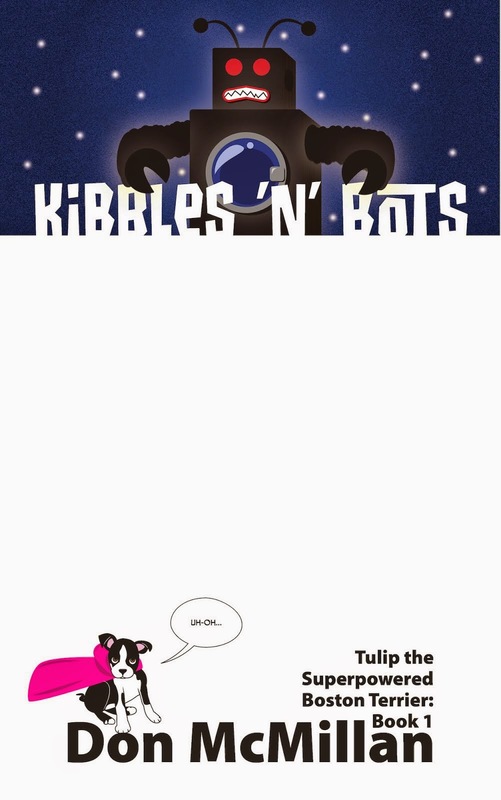 I also need to finally start bringing professional reviewers on board for my all-ages novel Kibbles ’N’ Bots so I can hopefully see some positive reviews (one so far, and surprisingly it is not from anyone I know!) and get some sales and excitement ramping up as I write the next book (I have loosely plotted the entire story by chapter, and I'm ~7000 words into the first draft thus far). There's also the small matter of creating over 50 little illustrations to put at each chapter head, which I really need to start. Ugh…so much to do.